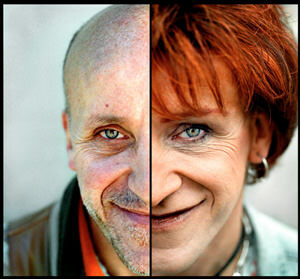 Today I woke at 0555 when Kate knocked on my window. I had plans to join to refuel Brett’s Husky, and then leave really early, but had forgotten my laundry – so I remained at the Bergomkant Lodge (very good!) and had a good breakfast and a relaxed start to the day. We fueled Brett’s aeroplane and I got also 20 liters to top up my tank. After all, I thought, I was only flying to Oudtshoorn, just south of a mountain ridge. About a 40-minute flight. I had a nice reception there by Mr Luc Thiry and a flight school for approximately 100 Chinese student pilots. The Moth was pulled into a hangar, and I got to tell the students about Cape to Cape, SAS and flying Airbus jets. 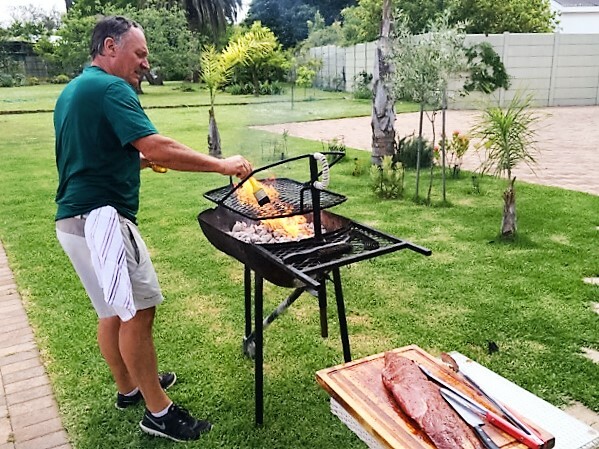 Luc took me to his home and family and made a “braai” – traditional prepartion of antelope meat over an open fire. It tasted fantastic. Thank you Luc and family! I wanted to get going to be in a better position for tomorrow and the big day, so we returned to the planes, refuelled and then made the next flight in 1:30, in a very good tailwind. 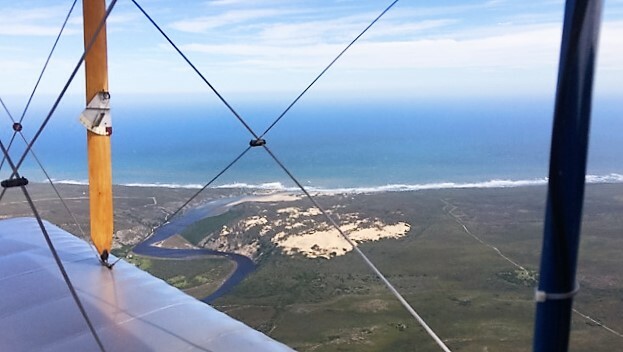 Shortly before I passed Overberg Air Force Base, the tower insisted that I make a low flyby, so I did. It was very windy and turbulent, so I did not get as low as would have liked, but I think it was appreciated! Seeing the ocean from Africa for the first time was also awesome! I love the sea, and for so many weeks, the Africa I have seen has been only dry land. 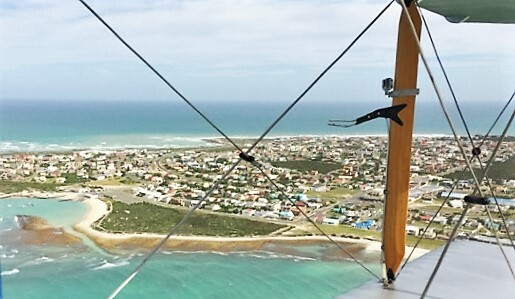 You can see the Indian Ocean in the picture and the Atlantic after Cape Agulhas. 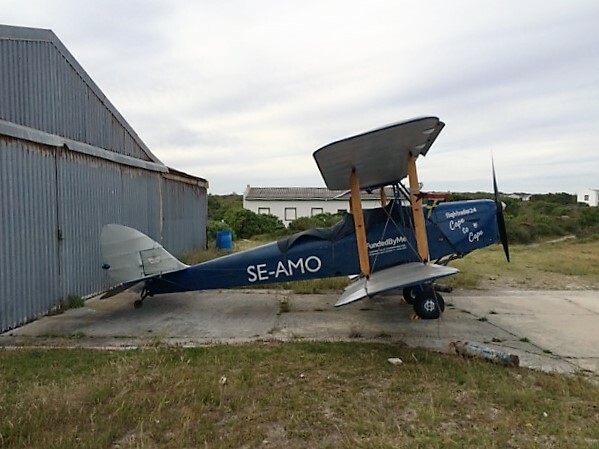 I rounded L’Agulhas and the most southern point of the continent, and then flew back for a landing at Andrew’s Field in winds up to 15 m/s – fortunately the winds were in the direction of the runway, so it went well. Starting to get used to this! The owner of the field had seen me fly over town and came out to the airstrip. Now I am safely at Mermaid Lodge. I plan to eat dinner now and make it an early evening. I can’t express how much I am looking forward to Stellenbosch– most of all to see my family, but also to see the schoolchildren, all the well-wishers and press, and to bring this amazing flying adventure to a close with a celebration. See you tomorrow!